My friend and colleague, Mike Rother, has done us a fine service. What experiments will you run next? Where can we go see the results? All fundamentally sound & helpful. Have I confirmed cause & effect? How do the two katas related? In fact, they express the same underlying algorithm and thinking, and are synergistic. 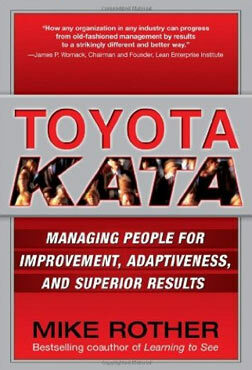 Mike's kata is very helpful in getting people started, and getting them necessary problem solving "reps". Toyota Kata also links problem solving to brain physiology and learning in a very interesting way. In summary, as Hemingway once observed, "It's all true..."